Join us this June 20 – 23 for the 12th Annual 4 Peaks Music Festival. Enjoy the Summer Solstice with 4 days and 3 nights of music, arts, and fun with your family & friends! This boutique, intimate, and eclectic Festival spans many genres of world-class musicians and kicks off the summer perfectly! Picturesque camping is free, as are kids 10 & under. Please see all details at 4peaksmusic.com. Early Bird Weekend Pass – $205 – Limited quantity. Sales end Mar 20, 2019 or when sold out. Young Adult Pass – $80 – Ages 11-17 require this pass (ages 11-15 must be accompanied by adult). RV Pass – $150 – Limited quantity. Sales end when sold out. Vehicle Impact Fee – $25 – This fee is needed any vehicle 18′ under to enter festival grounds. Excluding RVs & 3 Axle. We offering Luxury Yurt and Luxury RV Camping again in 2019, visit here more details or contact us. * ALL ticket prices are subject to a processing fee. 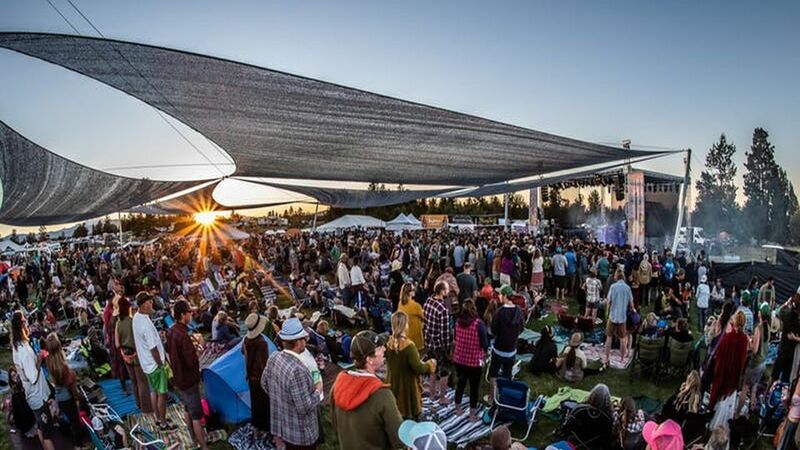 ** Bend Locals: There are tickets available at Cosmic Depot in Bend without processing fees! Please have cash or check as credit cards are not accepted. Support your Local Shop Cosmic Depot! ***All vehicles need a vehicle impact fee pass or a day parking pass (day parking can be purchased at the gates) if you are driving on site. There is a minimal $5 re-entry fee. Parking at the Stevenson Ranch requires the purchase of a vehicle pass, but you can have as many people in one vehicle as is legally acceptable. We encourage carpooling! There will be a day parking area for those who do not choose to camp, and day parking is a $5 fee. This year we are also partnering with Blazing Trails. They will be providing a shuttle to and from Bend’s Tetherow Resort to the Stevenson Ranch. More details coming soon and check our website and Facebook for info. As always, bicycle parking is free! If I want to camp with my friends, can I save space? We are sorry, but we are unable to accommodate this logistical nightmare. Everyone coming onto the grounds gets escorted into a parking/camping/RV space, by first come first serve. The first-come-first-serve policy allows us to fit all of our guests into the intimate festival grounds. Come together and camp together. *** However, we are once again implementing our RSVP camping system for our various camping sections. We will allow ticket holders to choose their section (not their spots). So, plan ahead with your friends if you want to camp near them. This does NOT mean you can save space or have guaranteed spots next to each other. If all of your questions are not answered after looking at our website, and you still need to converse with a real person, please feel free to email: willcall@4PeaksPresents.com and someone will get back to you. Are there food and drinks available? Yes, there is a wide range of food options for every palate (vegan to carnivore, breakfast to late night) and over 10 local brews, cider, Bledsoe Family Wines and Kombucha on tap, as well as coffee, tea, and other assorted beverages. There will also be ice on sale in the venue, so no need to leave once you are there!